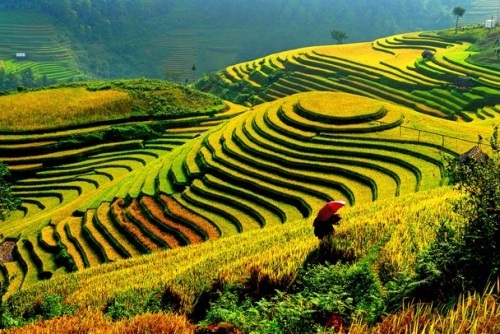 Hong Kong Airlines has dropped the price of many of their flights from Vancouver to Ho Chi Minh City, Vietnam throughout 2017 and 2018 down to $561 CAD roundtrip including taxes. The flights have 1 stop each way in Hong Kong for 4-5 hours. - Try Wednesday, Thursday, Friday, and Sunday dates in one of the months listed above. - Try Tuesday, Wednesday, Friday, Saturday, and Sunday dates in one of the months listed above. Not every date combination will work, but there are a *lot* of dates currently showing this price. If your dates don't show $561 roundtrip, try the flexible dates tip below. NOTE: After your Flighthub search completes, click on 'Flexible Dates' to see more dates that are available. (This feature is not available on the mobile site). 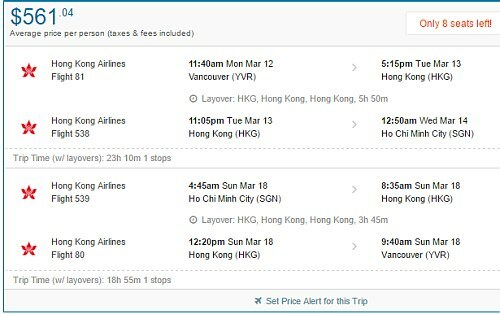 5 Responses to "Vancouver to Ho Chi Minh City, Vietnam - $561 CAD roundtrip including taxes"
I traveled to Hong Kong Airlines to Thailand and they were great. Are you kidding me?! Majority of Asian airlines are superb. Excellent service and working staff on board. I booked some of these tickets! Very excited!! If you book through the airline you pay about $40 more. I used the recommended flight hub site and I got confirmed tickets with airline confirmation number in about 10-15min. Does this allow for one week stop over in Hong Kong?